KILLING US SOFTLY WITH THEIR SONG. 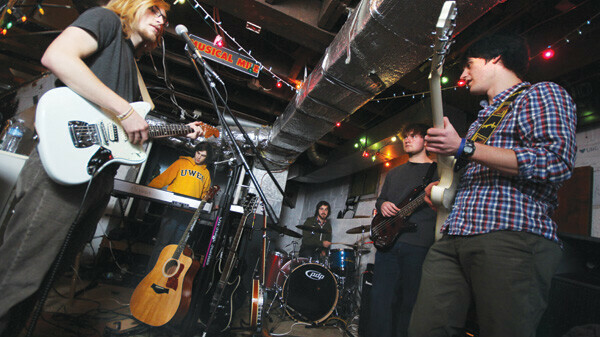 Eau Claire-based indie-folk rockers Softly, Dear plan on releasing their first EP, Portico, on Friday, June 7. Softly, Dear is a fairly recent indie-folk addition to the already rich Eau Claire music scene that loves jam sessions, exploring their stylistic range, and refining their sound. Their musical influences range from a broad variety of acts such as Miles Davis, Radiohead, and The Avett Brothers to local ones, including Laarks and Meridene. Softly, Dear is composed of several Eau Claire musicians, including the latest addition, Addie Strei (also of EC band Adelyn Rose) on bass. Strei joined the band after encountering some of the other members on the UW-Eau Claire track team. The rest of Softly, Dear is Alex Adkinson on drums, Ben Possi playing the keys, Tyler Hart lending his voice and guitar, and Josh Frederick on lead guitar. All of them are current or former UWEC students. An obviously successful combination, the group formed in late summer 2012 and began tracking its first EP on New Years Day. After an initial planned release date earlier in spring, Softly, Dear took some extra time perfecting tracks and is now releasing its first EP, Portico, at a live performance at 7pm Friday, June 7, at the Volume One Gallery. The EP will also be available directly through the band; at local retailers, such as The Local Store at Volume One World Headquarters; and online at softlydear.bandcamp.com. Portico was recorded at Pine Hollow Audio in Eau Claire with the help of local recording guru Evan Middlesworth, who provided not only an “incredible experience” for the band but also his own expertise and genuine sentiment for the record. Softly, Dear will be perform an EP release show at 7pm, Friday, June 7, at the V1 Gallery, 205 N. Dewey St., and as part of the Sounds Like Summer Concert Series on Aug. 22 in Phoenix Park.